PSS has produced an application note demonstrating how dedicated GPC/SEC software can be used to analyse heparin data in accordance with both EU and USP standards. Natural heparin is a polysaccharide and consists of molecular chains of varying lengths. Low molecular weight heparin (LMWH) consists of short chains and is used as anticoagulant in diseases that feature thrombosis and for prophylaxis against it. Because LMWH has more predictable anticoagulant effect and pharmacokinetics as well as less side-effects, it is recommended over unfractionated heparin. Various methods of heparin depolymerization are used to manufacture LMWH. 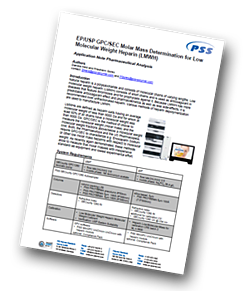 In this application, GPC/SEC is used to measure the molecular weight (molar mass) and the molecular weight fractions above/below a molecular weight limit using a procedure that complies with both EP and USP standards. Although the calibration procedures described in the EP and USP are totally different, a dedicated GPC/SEC software can be used to analyse the heparin data in accordance with both standards precisely. Once the calibration curve is constructed, the analysis of the data is comparable. All required molar mass information based on true heparin values are obtained. PSS WinGPC UniChrom GPC/SEC software allows additional markers such as 2000 and 8000 Da to be set and to display the measured percent below 2000 Da, above 8000 Da and in between these values.